I love streetcars, photos from the 1940s, fashions of the ’40s, and views of the Dallas skyline. And here are all of these things, in one great, GREAT photograph. 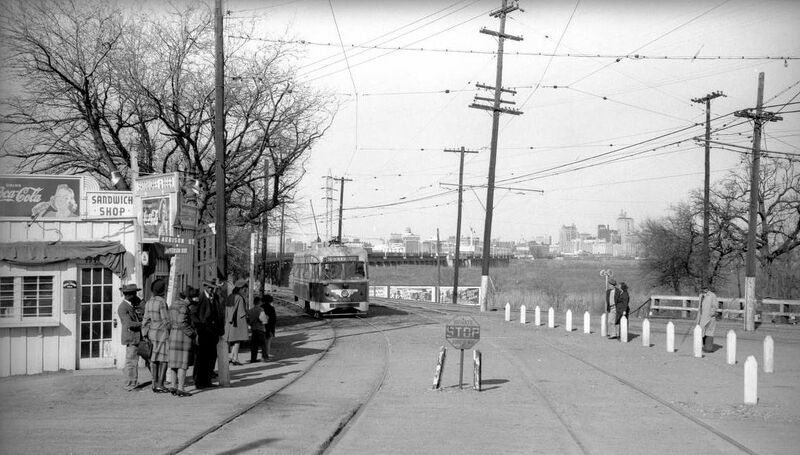 We see people waiting for the streetcar on a sunny Saturday in February, 1946 — in Oak Cliff, at E. Jefferson Blvd. and Addison St. 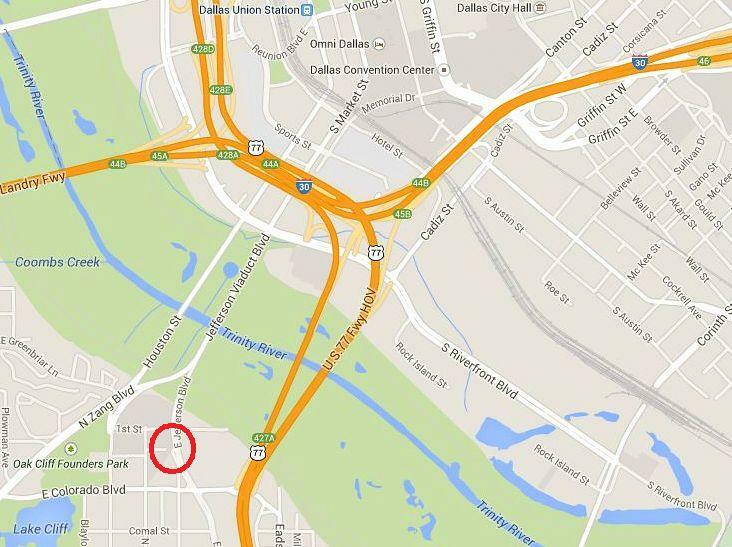 The people at the left (outside Helen’s Sandwich Shop) are about to catch the car that has just crossed the Trinity River and head into Oak Cliff; the people on the right are waiting to go to Dallas. The Oak Farms Dairy is just out of frame at the top left, and Burnett Field is just out of frame at the bottom right. The Dallas skyline looms across the Trinity. Photo by Robert W. Richardson, taken on February 2, 1946. From the Western History/Genealogy Dept., Denver Public Library, viewable here. More on rail enthusiast, writer, photographer, and preservationist Bob Richardson, here. Streetcars ran back and forth across the Trinity River on a special trestle just south of the Oak Cliff Viaduct/Houston Street Viaduct. It had been in use since 1887 (through various renovations) and was demolished in the early 1970s to build the present-day Jefferson Street Viaduct. 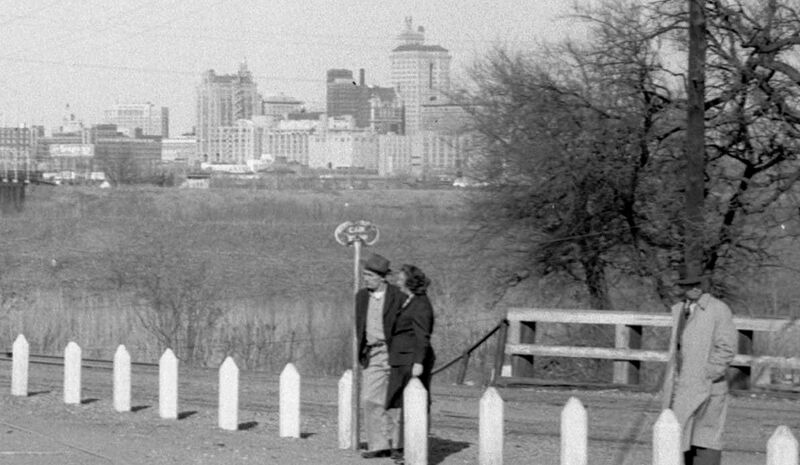 To see a photo by the same photographer showing a streetcar actually on the trestle over the Trinity, see the post “Crossing the Trinity River Viaduct — 1946,” here. Streetcar enthusiasts are incredibly, well, enthusiastic, and they keep precise track of where cars operated over their life spans. 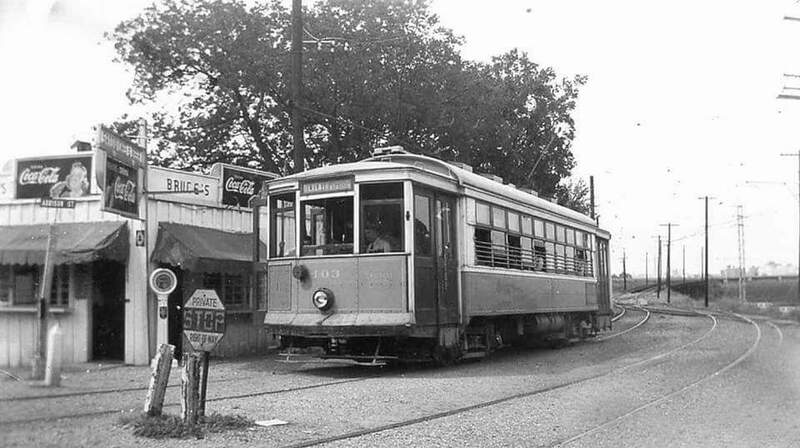 The car from the photo — Dallas Railway & Terminal Co. car #605 — was a PCC streetcar, built by the Pullman-Standard company in 1945; it was sold to the MTA in 1958 and was in operation in Boston for many years. 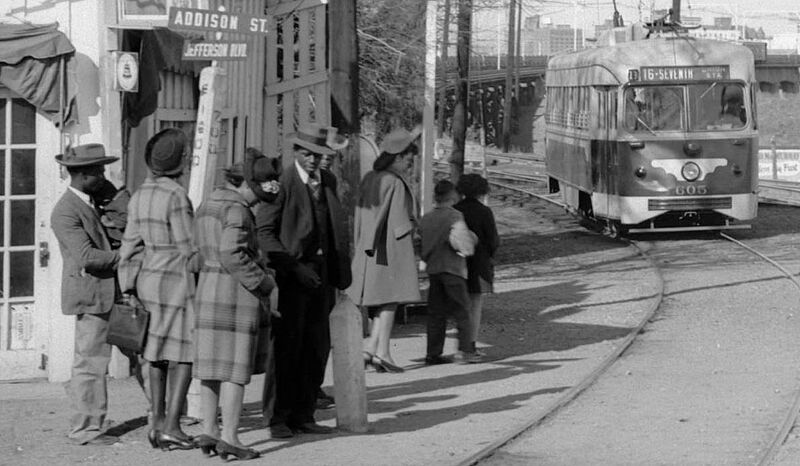 See cool photos of the very same streetcar in operation over the years in both Dallas and Boston, here (scroll down to “605”). To see what the retired car looked like in 2002 — a bit worse for wear — click here. A distinctly less-wonderful view from roughly the same location, seen today, is here. The trestles / aka elevated railway across the Trinity (to include the original channel, bottomland, and later diversion channel) actually dates to 1887 and also carried Thomas Marsalis’s original steam railroad then the later Interurban, both west and south lines. Thanks, M.C. — I’ll add the more specific date above. As I understand M C Toyer’s comments in the “Oak Cliff Trolley 1895” thread the scene presented here is perhaps a quarter mile or a bit more north and somewhat west of the earlier photograph. Is that reasonable? The two views are dissimilar, but both are very interesting.